Most people who live in Myers Park know the trees along our streets were planted when Myers Park was developed, but few people actually think about what it took to plant a large tree back in 1917. How did these men, almost 100 years ago, plant these trees? 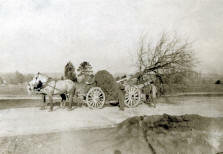 Modern machinery was not available in 1917, rather a tree mover , such as the one shown in the photographs below, was used to move every tree into place in Myers Park. In the first photo you see a man standing on the tree root ball just before it is removed from the ground. Based on the length of his shoe, Tom Hanchett, historian for the Museum of the New South, and I have concluded that this tree was about 10 inches in diameter which would make them approximately twelve years old. A ten-inch tree is pretty large and modern tree movers rarely move trees larger than that. 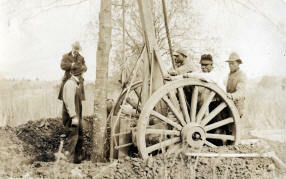 In fact I believe, that modern tree moving machines plant trees that are from six to nine inches in diameter. In most cases, smaller tree will catch up to a larger tree in a few years due to planting shock which is greater as the trees become larger. The original tree mover used to plant the trees in Myers Park is now in our possession. One of the older nurseries in the area was the Harkey Nurseries. Drane Harkey, who died a number of years ago, was the son of the owner of the tree planting machine and actually served as the water boy for the workers. Harkey Nurseries planted the trees in Myers Park and Dilworth. They also either planted the trees or were otherwise intimately involved in the planting of the trees at Duke University Trinity College Campus. Drane Harkey originally owned the tree mover that was used to plant the trees in Myers Park, and gave it to T. R. Lawing, Senior who has kept it on his property on Providence Road. Mr. Lawing has recently entrusted the original tree mover to me. It is my hope to see the machine refurbished to the point where it can once again be used to plant a tree with the help of a mule to pull it. To really appreciate the impact of planting larger size trees in Myers Park, consider this. My family moved to Charlotte in 1945 to a house on Beverly Drive. There were two trees planted on the planting strip and my brother and I used to jump up to the lowest limbs and climb up into the tree. One of those trees died years ago due to a leak in the gas line. The second one still stands and is 8 feet 9 inches in circumference or 33 inches in diameter at 4.5 feet off the ground. That willow oak is quite a bit smaller than the ones that line Queens Road West. The trees along Queens Road West are planted in rows of seven to ninedepending on the number of trees in the median. Some trees grew faster than others due to sunlight and available water and nutrients. Some of the larger trees on Queens Road West have a diameter of 42+ inches and on average have a circumference over 11 feet. Tom Hanchett who is presently the Historian of the Museum of the New South was in Charlotte from 1981 to 1987 and provided some of the research for Mary Kratt for her book “Legacy, The Myers Park Story” which is about the development of Myers Park. Both Tom and Mary say that the trees along Queens Road West, in particular, were planted around 1917. That makes those trees about 87 years old since they were planted in the ground. How old and how large were the trees that were planted? If the trees were really 12 years old when they were moved to Myers Park, that truly makes our trees almost 100 years old not. Nurturing and protecting our trees is more important than ever. The photo to the left is of the old tree mover on our trailer, getting ready to makes its journey to it’s new home. As we figure out how this machine works and what we have to do to repair it, we will keep you posted on our web site.